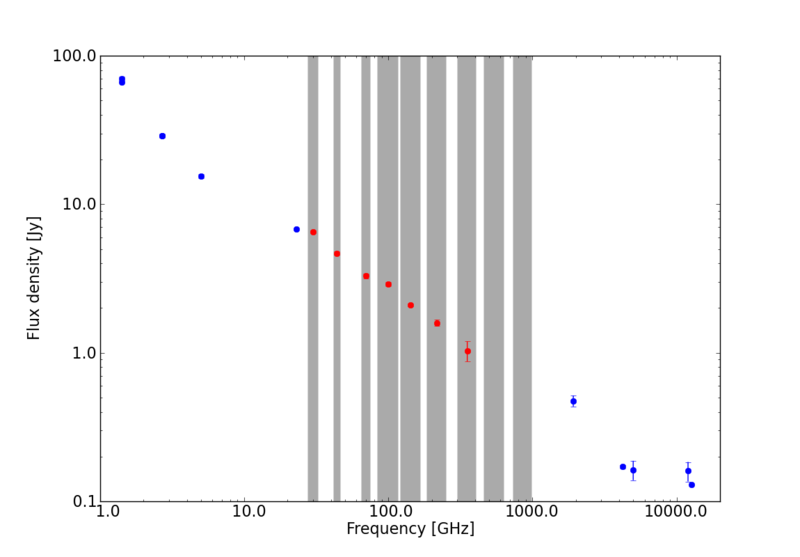 This graph shows the Spectral Energy Distribution (SED) of Pictor A, a bright and nearby radio galaxy, as measured by Planck (red dots) and previous observations (blue dots). The SED of Pictor A exhibits the power-law shape characteristic of radio galaxies, which is due to synchrotron emission from highly-energetic particles populating its so-called radio lobes. The new data points gathered by Planck fit extremely well in the overall shape of the SED, demonstrating Planck's ability to achieve robust measurements across the entire sky, spanning a very broad range of frequencies. 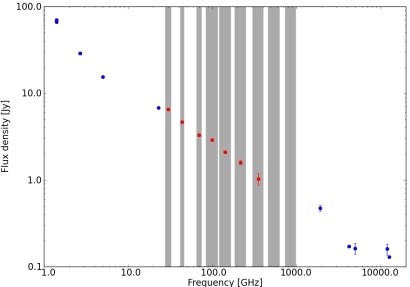 The nine frequency channels probed by Planck, covering the range 30–857 GHz, are plotted as grey, vertical bands. Pictor A, a very well studied radio galaxy, is one of the thousands of extragalactic sources listed in the Early Release Compact Source Catalogue (ERCSC), the first scientific product from the Planck Collaboration to be made publicly available. The data points at frequencies below 30 GHz correspond to observations performed with the following facilities: the 64-m Parkes radio telescope, located in New South Wales, Australia; the 100-m radio telescope of the Max-Planck Institute for Radio Astronomy, located in Effelsberg near Bonn, Germany; the 43-m Telescope of the National Radio Astronomy Observatory (NRAO) in Green Bank, West Virginia, USA; and the Wilkinson Microwave Anisotropy Probe (WMAP). The data points at frequencies above 1000 GHz correspond to observations performed with the IRAS and Spitzer infrared space telescopes.